Recover photos, messages, contacts, videos and more. Recover data from iPhone and other iDevices. Safely recover data with only three steps. Many circumstances could lead to the data loss, but are there really lost? Cisdem iPhone data recovery software provides the best recover solution for you. Do not be panic! Cisdem iPhone data recovery software can help you get the lost data back. It can work for all devices running iOS to recover lost and deleted photos, contacts, messages, notes, videos etc. Photos and videos are the collection of our happy moments in our life. Cisdem iPhone recovery software is supposed to be the best saver for you! It can help find all the photos/videos, even the deleted ones, and allows you to select what you need to recover in bulk after preview. The messages, contacts and notes on your iPhone may contain personal information and losing any of them can be a huge loss. With iPhone recovery software, you can recover them easily. And it can clearly show and save the various attributes assigned to your messages, contacts and notes. How iPhone Data Recover Software Works? After we deleted data, the system will remove the pointer what makes us cannot track of where files are and marks the sectors containing the file’s data as available. Until system actually writes new data over the sectors containing the contents of the file, the file is still recoverable. Hence, Cisdem iPhone data recovery tool utilizes this theory to recover the lost and deleted data easily. 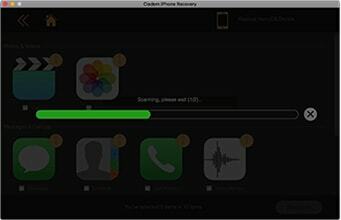 Two recovery modes helps to get data back - Recover from iOS device & Recover from iTunes backup file. Connect iDevice with your Mac, or you can select iTunes backup files of your iOS device to scan. After the scan finished, you can preview and choose the files among photos, contacts, messages, videos etc. to recover. Directly scan iPhone/iPad/iPod touch to recover lost data. Extract the iTunes backup to retrieve lost data. Preview the detailed content of your lost data. Recover the files you want by selecting them out. Export the found files to local computer to save. Search with keywords to quickly pinpoint what you want to recover. "Recover lost data from your iOS device without wasting time or resources. 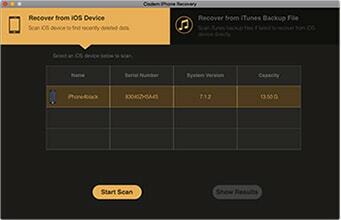 Within the Cisdem iPhone Recovery user interface you get to review the recovered data, and you get to choose exactly what you want to extract. This way, you don’t have to waste time recovering an entire backup." "By far the easiest to use. iOS 11.01 update wiped all the data on my iPhone 6S. My wife threatened to kill me over the contacts and messages. I just don't know how to describe my gratitude for the product. Anyway my contacts are back now and I could have a good sleep tonight." "How stupid of me to leave my iPhone 6 to My little girl. While she was playing around, she dropped my phone to the floor and broke the screen! I thought it was just gone. Good news is that I can still save all my contacts and text messages with the iPhone data recovery tool. Also, this is by far the best iPhone data recovery software I've seen. Unlike other software which crashes in the middle of recovery, it runs so steady!" "Tried this in desperation after accidently deleted my Notes whilst messing around with some upgrades. With Cisdem iPhone Recovery, I was particularly pleased that I could actually ‘look’ for the information that I needed to retrieve, without having to buy first, as I was unsure whether or not it would be there." Directly connect your iPhone/iPad to recover the lost data. Extract the iTunes backup to selectively retrieve lost data. Recover messages, contacts, call history, Safari bookmarks, notes, calendar, and reminders. Preview recovable files to see what you want to recover. Preview photos in two methods: thumbnails or lists (categorized by date). 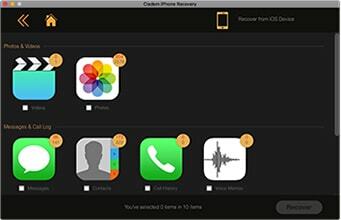 Your best solution for iPhone Recovery quickly recover your lost data - photos, messages, contacts, notes and more back on your iDevice without quality loss.